Cirque Du Soleil Performer Falls To His Death During Show In Florida : The Two-Way Veteran aerialist Yann Arnaud slipped off the double rings during a performance and fell 20 feet, according to the theatrical company. He died of his injuries at a hospital on Sunday. 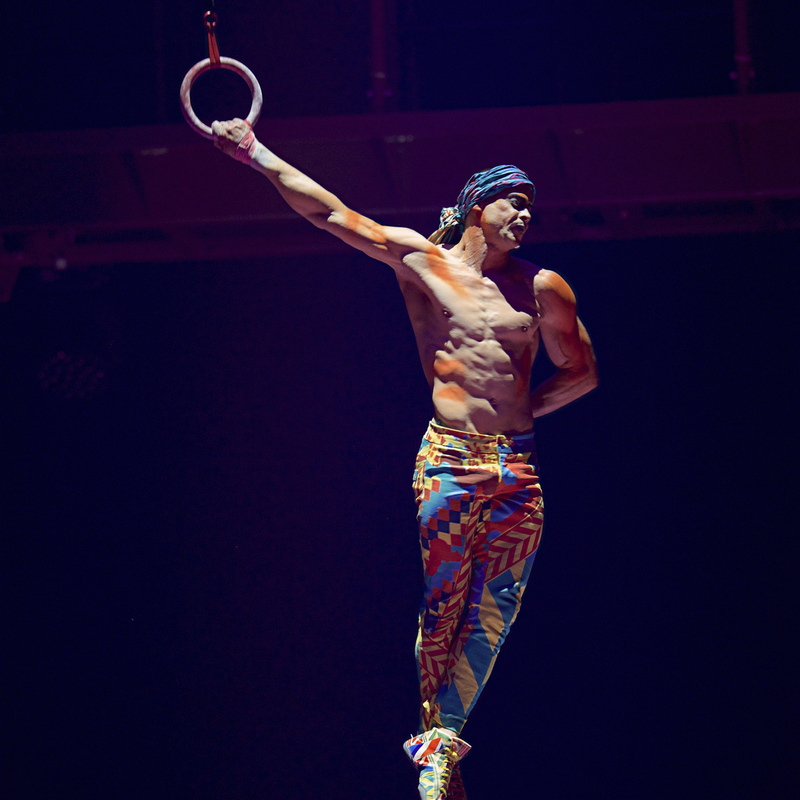 Yann Arnaud performs during a Cirque du Soleil show in Toronto in 2017. Arnaud died early Sunday after falling while performing on Saturday in Tampa, Fla.
A Cirque du Soleil performer died after falling at a Tampa, Fla., show over the weekend when his hand slipped off the double rings, the theatrical company announced Sunday. "While he was performing the aerial straps number, longtime aerialist, Yann Arnaud, fell onto the stage," Cirque du Soleil's VOLTA said in a statement on Twitter. The statement said that the 38-year-old fell about 20 feet. Emergency procedures were initiated, it said, and Arnaud was taken to a hospital, where he died from his injuries early Sunday. "The entire Cirque du Soleil family is in shock and devastated by this tragedy," the statement said. "Yann had been with us for over 15 years and was loved by all who had the chance to know him." Ben Maldonado, who was in the audience when the fatal accident occurred, told WFTS, the ABC affiliate in Tampa, "They were doing a dance routine on stage and they had these streamers coming down from the roof." "One of the guys lost his grip and fell from the streamer down to the floor. The other performers, everybody just stopped on stage and were just pretty much in shock like we were," he told the television station. Following the accident, Cirque du Soleil canceled the remaining two shows of the VOLTA tour in Tampa. Although such accidents are not common, a Cirque du Soleil acrobat fell to her death in 2013 during a performance in Las Vegas. A previous version of this story described the performer who died in 2013 as a dancer. Instead she was an acrobat who died in an onstage accident. We have removed an erroneous description of that accident.